Hindenburg transported large amounts of mail and valuable freight in addition to providing passenger service. Hindenburg’s maiden flight to North America included 1059 kg of mail, primarily first flight covers destined for stamp collectors. Later flights between Germany and North America carried between 90 and 236 kg of mail, including commercial mail as well as philatelic items, and flights within Germany and Europe also carried philatelic mail for collectors and zeppelin enthusiasts. Note: The “Sieger numbers” mentioned below refer to the Zeppelin Post Katalog published by the Sieger-Verlag of Lorch/Wurttemberg. The Sieger catalog is invaluable not just as a philatelic reference to zeppelin mail, but also as a historic resource, since the catalog contains a comprehensive list of all flights by German commercial zeppelins from LZ-1 through LZ-130. Hindenburg carried its largest volume of mail (1059 kg in 60 mail sacks) on its first flight to North America. The majority of this mail was philatelic (i.e., created as souvenirs, or for stamp collectors) rather than commercial, and because of the large quantity of mail, these covers are not generally valuable unless they are unique in some way, but they are wonderful (and easy to find) souvenirs of this historic flight. Letter written by Lady Drummond Hay to Clara Adams, and posted on board. These covers are also relatively common, as Hindenburg carried 824 kg of mail on this flight. 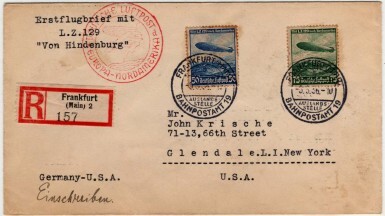 Forgeries of mail from Hindenburg’s first flight to North America are rare, because these covers are generally not valuable enough to justify forging. But a well known forgery was created in 1938 by a German stamp dealer named Julius Bock, who claimed that these covers were flown to North America and back to Germany; in fact, they never saw the inside of a zeppelin. Bock made the glaring error of franking the covers with the wrong amount of postage (.55 Rpf, a rate for printed matter that was not valid on this flight). There are also errors in the lettering of the postmarks applied to these forged covers. Forged cover sold by Julius Bock in 1938. I welcome comments and emails, but please note that for various reasons I don’t like to offer an opinion on the value or authenticity of zeppelin covers or other items of airship memorabilia. I searched my father’s Zeppelin collection and found a Julius Bock forgery cover. Thanks for the information. I have been looking for the rate for a simple cover mailed from Germany to USA via the Hindenburg airship. Perhaps I have missed the appropriate page in the Michel Zeppelin catalogue but I have been unable to find rate tables for this service. I have a nice envelope from Germany to my grandfather with 4 different zeppelin stamps. It was dropped on THE LAST FLIGHT of the Hindenburg above Rotterdam Any clue of its value or who might have an opinion? I have a letter, given to me by my mother, which travelled on the Hindenburg’s first return flight from Lakehurst to Frankfurt. Are there many such still circulating, or are they more rare. That flight carried 824 kg of mail, including tens of thousands of letters carried on that flight. Most are not rare, but still a nice physical connection to a historic flight! Let me just say that it is an honor to have Jim Graue — one of the true experts on aerophilately and zeppelin mail — comment on the blog. Welcome, Jim, and thank you.